Any real estate agent will tell you one of the first things clients usually ask about when looking to rent a property is the kitchen. Does the rental have a functional kitchen, with moderate upgrades and a good layout? Attractive kitchen cabinets, countertops and flooring can greatly increase how much you get for your rental property each month. If you assume a somewhat outdated kitchen is just fine you will find renters, but not ones willing to pay as much as you might hope. Rental properties within the same area rent out for vastly different prices, and for very different reasons. Yet, one of the BIGGEST influencers in overall rental price is the appearance of the kitchen and bathrooms. You can increase rent an extra $50-$100+ each month with the right kitchen renovation. 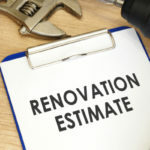 In this blog we explain the importance of renovating rental property kitchens, as well as the best renovations for the biggest return on investment. 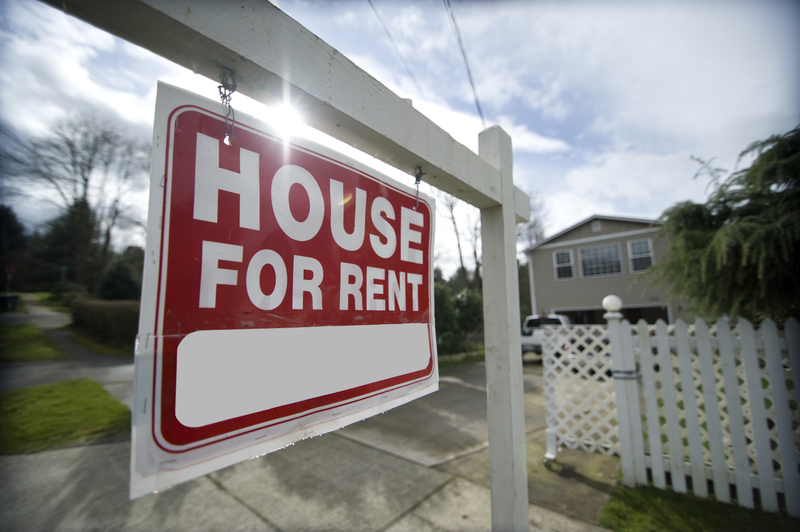 A rental property is borrowed and used for an agreed amount of time, leading some investors to assume the little details don’t matter to renters. Although renters don’t own the property they still care about the overall appearance and functionality of the place, especially if they are willing to pay a little more. Certain upgrades are going to have a far greater impact on how much money you are able to charge each month to rent out your investment property. Kitchens and bathrooms are the most important rooms to upgrade for rental properties. Bedrooms can be spruced up with nice bedding, furniture, and wall decorations, but the kitchen and bathrooms pretty much comes as-is. 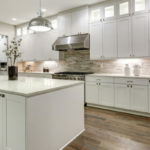 The cabinets, countertops, flooring and appliances are there to stay, and since kitchens are used at least 3-times a day these features are very important. The cabinets, are they functional and up to date in regards to style? The flooring, is it able to stand up to the wear and tear a kitchen regularly endures? The countertops, is there enough space, and do countertops look clean and modern? The sink, does it look nice, functional well, and appear clean? Learn when you should replace kitchen cabinets. When it comes time to renovate a rental property kitchen you never want to over do it. This isn’t your home you are going to live in, so while renovations need to be nice they don’t need to be over the top. Renters are not interested in paying more for a property based on overpriced marble countertops or a smart fridge with app capabilities. When replacing appliances and other features (like cabinets and countertops) don’t pick the most expensive option, instead opt for middle-grade. Save luxury splurges for your own home, and don’t waste your money thinking renters want to pay for these extras. No one wants to cook in a kitchen that looks like it belongs on The Brady Bunch television show. This is 2015 and people want to cook in a kitchen that reflects that. Take a look at the kitchen in your rental property. What about it stands out as modern, and what about it makes you feel as though you have traveled back a decade or two via time machine? Those light oak cabinets with big white handles are so out of style, as well as those old, clunky stoves. Replacing outdated features and appliances is a great way to breathe new life into a kitchen and thus get more money for your rental. If kitchen lighting was installed prior to 1990 it’s time to knock out the old lighting and install something new. Lighting fixtures are affordable, easy to install, and can add a great deal of style to a space. Overtime, all of the steam and oils that float around a kitchen build up on cabinets and walls creating a dingy, off-color appearance. You can’t control how often your tenants clean off cabinets and walls, but you can make sure future tenants have a fresh coat of paint. Properly painting walls, ceilings, and even cabinets can instantly update the look of a kitchen so that it looks fresh, new, and appealing. You don’t want to go overboard installing upgraded features, but by adding one or two luxury focal points you can grab attention and make people feel like they are getting a good deal. 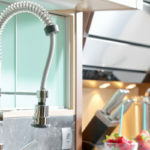 For instance, adding a few glass-faced decorative cabinets, or a nice pullout sink nozzle can make your rental property kitchen stand out against the competition without breaking the bank. 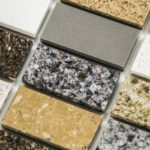 If you are redoing floors or countertops, or some other big-ticket item, it’s important to pick materials that can really withstand wear and tear. For instance, avoid light color grout, which might end up looking like a mess 2-years from now. Pick darker colors that are easier to keep clean and free of stains. If your cabinets are still in good shape but need some sprucing up, try adding new cabinet hardware. This is an easy and affordable way to update cabinetry in a flash. Check out our blog post on how you can save money through a surface kitchen remodel. For affordable kitchen renovations contact Tops Kitchen Cabinet today! We offer the very latest in kitchen countertops, cabinets, and more all at wholesale prices.